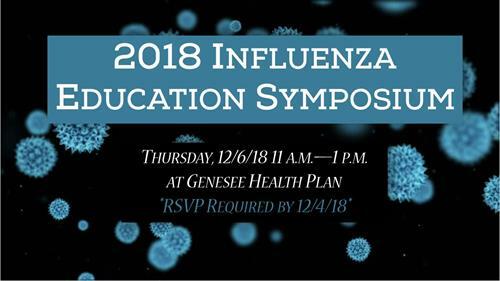 The Genesee County Influenza/Immunizations Education Partnership is having its 2018 Influenza Education Symposium on Thursday, December 6, 2018 from 11 a.m. to 1 p.m. at the Genesee Health Plan office. Symposium will focus on what to know about the flu. Lunch will be provided. Symposium Facilitator will be Dr. Gary K. Johnson, M.D., NPH, and Medical Director of the Genesee County Health Department.